"Cotechino is a large, Italian pork sausage traditionally served to celebrate the New Year. Its thick casing is pierced all over with a knife, then gently braised in a pot of lentils until done. After the sausage is cooked, it's sliced into round coins, which are then fried crisp in a pan, and used to garnish the lentils or beans." Place cranberry beans into a large container and cover with several inches of cool water; let stand 8 hours to overnight. Heat 1 tablespoon olive oil in a Dutch oven over medium-high heat. Stir in onion. Cook, stirring, until onions are softened and translucent, 6 to 8 minutes. Stir in cranberry beans, chicken broth, water, Italian seasoning, bay leaf, red pepper flakes, rosemary, and thyme. Pierce Cotechino all over with the tip of a knife, then place in broth and beans mixture. Bring to a simmer, skimming any foam that accumulates. Reduce heat to low; cook until beans are tender, 1 hour. Transfer Cotechino to a cutting board; discard string and casing, then slice into 1/4-inch rounds. Stir Swiss chard into bean and broth mixture. Simmer until chard is wilted, 3 to 4 minutes. Season with salt and black pepper to taste. Heat 1 tablespoon olive oil in a skillet over medium-high heat. Working in batches, cook the Cotechino rounds until crisped and browned, about 1 minute per side. Ladle beans into bowls and top with Cotechino rounds. 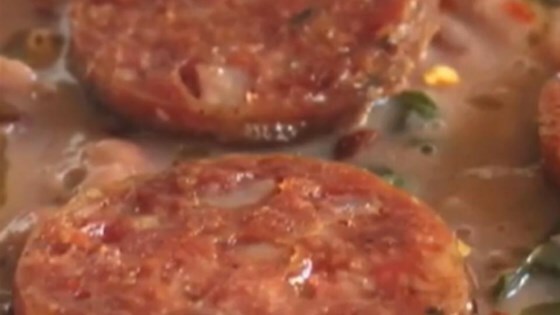 See how to make a sensational braised pork sausage and white bean dish. Cranberry beans are also known as Borlotti beans. If you are unable to find them, you can substitute white beans, Great Northern or Navy beans. Green or black lentils would be good, too.